I've got the ink bug again, mainly due to my buddy asking for a new design. Havent had any work done for over 7 years and wants some more. This design has been on the back burner for over 8 years now, basically the upper koi and kanji is presently on my upper left arm, the lower ones were drawn as an extension to the piece. I've purposely left space on either side so I can wrap the waves/water design around to make it a full sleeve. Originally drawn in pencil and coloured with ochre watercolour, added to PS for layout and colour balance. mate, can I do this on my sleeve? I literally searched the whole internet for something I like and is simple, beautiful and meaningful (obiously like this one ) and haven't found anything else. I would ask the tattoo guy to design something but it wouldn't be anything close to this. And about the meaning of the writing...it's perfect. Good job! That image is whats on my arm, its a personal piece and at times wish I'd never uploaded BUT art is about sharing, sharing that passion and if it inspires you to have something as meaningful as a tattoo then I'm happy to allow it. May I ask you, what is the meaning of those ideogram? The calligraphy is Hatsun Jindo, which means 'parting the clouds , seeking the way'. It was penned by master Gichin Funakoshi. Though I have seen some of the older works like this one actually done on location, and it looks very similar in style. You wouldn't happen to still be designing would you? 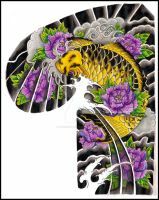 I am still designing in between freelance gigs, I've just finished another koi tattoo design but cannot show due to my clients wishes. wow this is awesome!! I've been looking for something to get on my arm and would like something along these lines. I'm probably going to have a friend of mine draw something for me though but this is great work!!! looks great! and i love how the kanji looks, what does it say? I so want to tattoo that to my body. I am not sure I could sit still long enough to get it. LOL I get antsy when needles are involved. My tattoo artist would end up knocking me out just to get any of it done. If I ever do tattoo it to my body I will let you know and post it on here with a link to you. tattoo's are incredibly addictive although its been a few years since Ive had a new one, perhaps its time I got more ink? If ever you get any and use this design I'd love to see it. I will totally be posting it on here if I get any tattoo. Tattoos are a way to express one's self on their body. That is art to me. I totally agree, its a shame when people just get any design tattooed on themselves without any consideration. A fantastic koi design, easily some of the best I've seen so far. Do you do commission work at all? I ask because I've been looking to have a koi/water tattoo done as a shoulder piece around my kanji tattoo that is already there, I really like your style that you used in this piece. I'm looking into getting a koi fish tattoo on my right ribs, with maybe some flower in the mix... maybe you could design it for me! beautiful, nice flow, and koi are always a nice addition to a sleeve. this is a very skillful piece i admire your work fave. Would it be ok for me to use this tattoo?!?!?! That should be a print. Wait. Wait. There's actually a water mark in there!!!! Pics will be shown right? This is going to be a beautiful sleeve. as i read it good you got this or at least a part of it already on your arm right ?